The super handy Handisleeve by Umbra will help avoid those pesky morning coffee spills and keep your hand off of that hot cup. 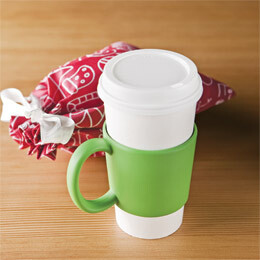 This cool and useful sleeve with handle will fit around disposable cups and in most car cupholders. Great gift for coffee drinkers and coworkers.